This Christmas, I received three books. All three books are cookbooks authored by women. They are so good I decided to do a book review for each of them. So, here is book one. You know the book is going to be good when it contains a chapter entitled “The Assurance of Caramel Cake”. You know you will love it when you see recipes for spoon bread, next to veal medallions next to éclairs. You know that when you settle down to read it and you decide instead to read it aloud to your children that you have surpassed the terms “cook” “book”. 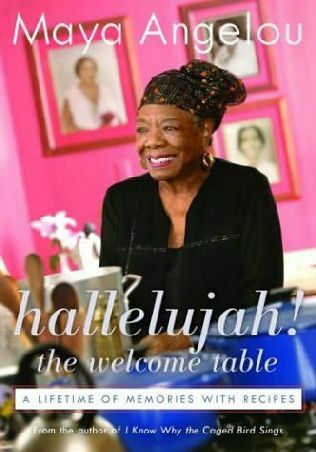 And so it is with Maya Angelou’s Hallelujah! The Welcome Table. I don’t really think any more recommendations are necessary once you can see who wrote the book. Maya Angelou has a way of making words come together in a rhythm that has a top note and melody that sings sweetly of the deeper meaning under her phrases. Her words simply sing. They transport you into whatever world she is spinning. Lucky for you in this book the world she is taking you is her own. It is her memoir of life with food. Each vignette entwines food, family and friends and ends with a recipe. What could be better than that? It is the timeline of Maya Angelou’s life in recipes. Her childhood, stories from her community, her first love, her finding her voice as a writer, even the recounting of her first meeting Oprah finds its way into the book. My favorite chapter is “The Assurance of Caramel Cake”. It is story of her grandmother’s caramel cake and it is a story of her grandmother’s love. It is unconditional love in cake form. (The best kind in my opinion) I read the story and the recipe aloud to Maeve and Hilde. They loved it. Maeve promptly requested this caramel cake for her birthday. The story makes a point of saying that the cake takes five hours to make. Five hours of baking for a birthday cake. I toyed with the idea of saying yes to Maeve and hoping that she would forget but then it occurred to me that Maeve never forgets. Accuracy is her middle name. Then I wondered what would happen if I said no to making the cake after reading the story, which so clearly explains that caramel cake is the equivalent of love and I couldn’t do that either. So, this year for her birthday Maeve will be getting Maya Angelou’s Grandmother’s Caramel Cake (Or my best interpretation of it.) Because just like in the story, I will go to any length to show my children how much I love them and cake is a good place to start. If you don’t cook, you still need this book because of the stories. If you cook you need this book because it transforms the genre of the cookbook into a literary masterpiece. I would also encourage teachers to use this with your students. I think it would be great while studying Ms. Angelou to actually cook some of the recipes. As for me, I need to cracking; I have three months to get this cake right. Go Meat! versus No Meat!